Class that helps perform 2-pronged boosted tagging using a reclustering in the jet's rest frame, supplemented with a cut on N-subjettiness (and a decay angle), as discussed by Ji-Hun Kim in arXiv:1011.1493.
recluster them using another jet definition (the original choice was SISCone in spherical coordinates with R=0.6 and f=0.75. where the sum runs over the constituents of the jet. Note that in the original version, the jets to be tagged were reconstructed using SISCone with R=0.8 and f=0.75. Also, b-tagging was imposed on the 2 subjets found in the rest-frame tagging procedure. 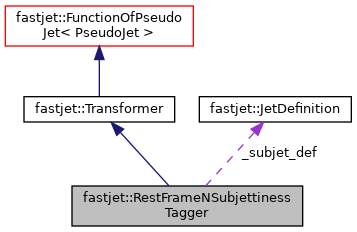 The first argument is the jet definition to be used to recluster the constituents of the jet to be filtered (in the rest frame of the tagged jet). Definition at line 101 of file RestFrameNSubjettinessTagger.hh. 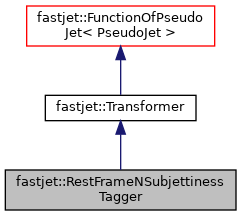 Definition at line 59 of file RestFrameNSubjettinessTagger.cc.